The Brazilian cities of Fortaleza and Brasilia will host the 6th BRICS Summit on the 14th, 15th, and 16th July, an event that will showcase the growing economic clout of the five countries. The 2014 Summit’s debates will focus on the theme “BRICS – inclusive growth: sustainable solutions”. As part of a BRICS outreach strategy to emerging economies, a working session will be held on 16th July between the heads of states of BRICS and their counterparts from the governments of South American nations. Argentina had expressed interest in joining the powerful bloc, although BRICS have ruled out expansion of the group for now. BRICS Finance Ministers and Central Bank Governors meeting, Trade Ministers meeting, Development Bank Presidents meeting, Business Forum and a session of the BRICS Business Council will be held on 14th July in Fortaleza. The $100 billion Contingency Reserve Arrangement (CRA) will be launched at this year’s Summit and final details of the New Development Bank (NBD) will also be unveiled. In the Durban Summit last year, leaders from Brazil, Russia, India, China and South Africa had approved a $100 billion fund to combat currency crises. “The establishment of a self-managed contingent reserve arrangement would have a positive precautionary effect, help BRICS countries forestall short-term liquidity pressures, provide mutual support and further strengthen financial stability,” South African President Jacob Zuma said after the five BRICS leaders met in Durban in March. BRICS have 43 per cent of the world’s population and total foreign-currency reserves of $4.4 trillion. Brazilian Ambassador José Alfredo Graça Lima addressing a press conference in Brasilia on Tuesday said the keenly awaited BRICS Bank will finance infrastructure and sustainable development projects. Developing nations have long complained that the World Bank and International Monetary Fund are failing to address underdevelopment and Western nations have too much say over the management of these institutions. The BRICS Bank’s start-up capital of $50 billion would eventually be built up to $100 billion. Russia has proposed that each member contributes an equal, 20 per cent share. 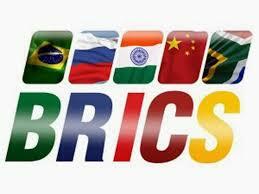 All the members of BRICS except Brazil has proposed to host the Bank. Social inclusion and sustainable development will be in focus during this year’s summit. The 6th Summit will inaugurate the second cycle of BRICS, with each member country hosting one summit each. The African Union attended last year’s Summit as observers even as BRICS countries try to increase bilateral trade with the continent. Meanwhile, the invitation this year to Latin American heads of states comes as the region tries to match the inspiring growth rates of above 4.3 per cent of 2004-11. Meanwhile, South American nations are also jointly exploring the creation of a communications system to curtail US spying in the region. Latin American countries raised a storm of protest after, according to US NSA leaks by former contractor Edward Snowden, the agency spied on an array of nations in the region, including Brazil. The meet in Brasilia with a congregation of BRICS and South American leaders in attendance could call for an end to mass surveillance like the one carried out the US intelligence agency and gross invasions of privacy.